Jason Dry Spray Deodorant - 113ml - $14.99 - in 2 light scents: Soft Rose and Fresh Cucumber - in air-propelled sprays that go on dry with no wet feeling or residue on skin or clothes and deliver clinically tested 24 hour odour protection. 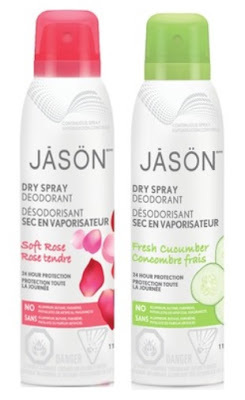 Of course what's really great is what it doesn't contain - no aluminum, butane, parabens, phthalates, artificial colours or artificial fragrances - just fresh, light, powerful protection - just what we need on these hot, sticky summer days! Available at Whole Foods, Loblaws, well.ca and natural grocers across Canada.